Reportedly, February saw the biggest fall in the last 12 years in car sales – passenger car sales in February 2013 declined by 25.71% over February 2012. 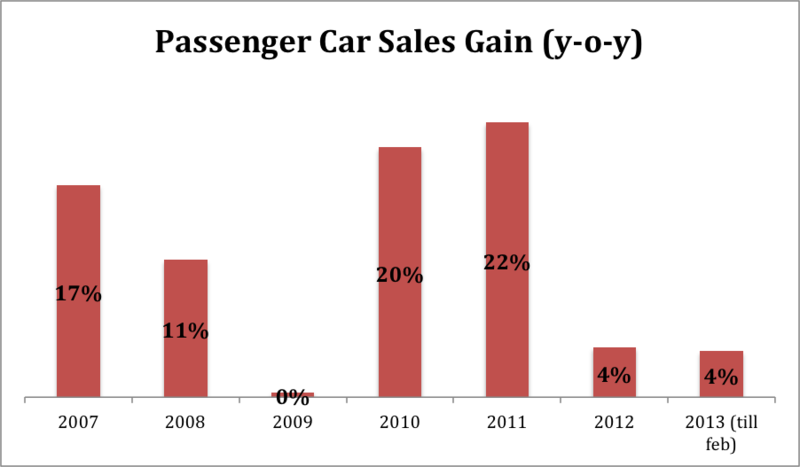 Overall the car sales increased by only 3.68% over last year (Source: SIAM). Given the high interest rates and soaring fuel prices, the car market is expected to remain weak. In the wake of such circumstances, car manufacturers are thinking outside the box, or at least stretching it to regain sales momentum. To lure in customers, car manufacturers are offering several attractive offers across their range of cars. While some are offering 0% interest, others are offering attractive EMI schemes, some are doing buy-backs and exchanges while some are offering additional accessories and fittings for free. Nothing new in this kitty, these are typical of March, because its year-end for everyone. But wait, car manufacturers are now offering something new too. For example: Volkswagen is offering a trade-in scheme, where you can bring in your old car + Re.1 and take home a brand new Vento, rest of the payment to be made after one year, in full or in attractive 36 EMIs. Tata Motors is offering its Manza customers 60% of the purchase price after three years. That’s quite an attractive offer, locking in the resale value, knowing for sure that you will get 60% of your car’s price, Given how poor the resale market has been in the past few years, with so many players in the market and manufacturers introducing new models and upgrades to old ones much more frequently, buyers are spoilt for choice even in the resale market. It’s understandable that the car manufacturers themselves are offering such bold schemes because they have the deep pockets to take in some of these costs, but there are some entrepreneurial automobile dealers who have come up with some innovative offers for their own markets. A Jaguar Land Rover dealer in the north gave 15 cars to the who’s-who of society without taking a penny. He knew these people would pay him eventually given their status in society, but to just send off 15 of such high-end cars is quite a gutsy move. He was only trying to capitalize on the North-Indian “if he has it, I should have it too” attitude and it worked well for him. 15 Jaguar and Land Rover cars were on the streets of this not-so-big city, getting noticed and inquiries started pouring in. Plus the word of mouth from none other than the who’s who of the city helped him tremendously. Tough times are calling for some tough calls, and manufacturers and dealers are tackling them with some innovative approaches. Entry filed under: Marketing, Observations. Tags: Automobiles, offers, passenger cars, Sales. Thank you for comment. I hope that you will visit some of our websites. Website are always welcome.